Boy, is that ever true. We haven’t been this active socially since we were communists. We’re still here at the fabulous Club de Pesca, where it’s been an endless series of parties, drinks, dinners, restaurants, etc. since we got here. Luckily, Colombia is not very expensive, and we still have some energy left over from our youths. There are several cruising boats here, plus many friendly Colombian boaters, all conspiring to create an ongoing floating party. Plus, the Club and it’s members are extraordinarily friendly (as are most Colombians), so we’re included in many of the Club’s social events. The best was the recent annual regatta. It was part fishing tournement, part sailing races, and endless parties. I was crew (tripulante) on an English friend’s boat. 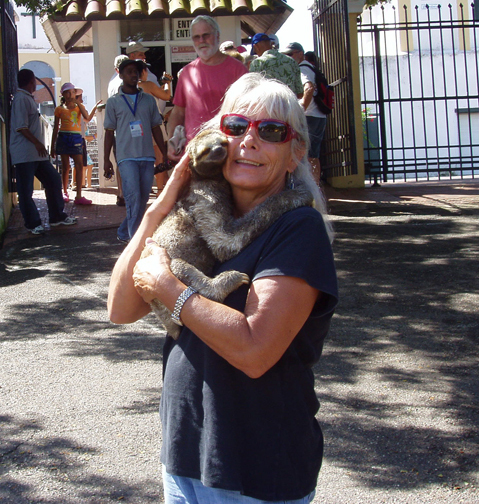 As crew, Phyllis and I were invited to all the events of the regatta (3 breakfasts, 3 dinners, free drinks, other events). The last day’s race was the “Admiral’s Cup”, named that because each entry had a real Colombian admiral as crew. We took secundo (second) in that race. What a trip! We screamed across the finish, turned hard right, and then paraded by the “Gloria”, the Colombian cadet tall ship. All the cadets and officers aboard “Gloria”, in dress whites, snapped to attention, pipes were sounded, and they saluted us and our admiral. After we docked, we attended a party on the “Gloria” where we were presented our trophy for second place. Phyllis loved getting served drinks by all those cute cadets. I, on the other hand, liked getting served endless free scotch by the 3 lovely “Grant’s girls” provided by the club. Also, free wine, food, entertainment…..yikes, these people can party. 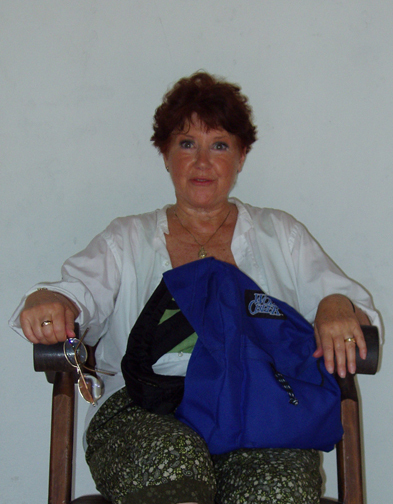 Recently, I read an article in a cruising magazine about Cartagena. The author described the two choices of marinas: the Club de Pesca (where we are) and the Club Nautico, where, by far, most of the other cruisers stay. He aknowledged that Club de Pesca was nicer (the other place is somewhat of a dump), but disparaged the Club de Pesca (and, by extention, those of us who stay here) as being somehow uppity. 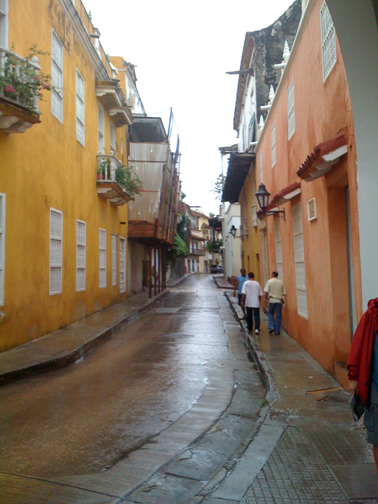 What he doesn’t get is how much staying here, (mostly among Colombians), instead of there (mostly among Americans, Canadians and the dreaded French) has contributed to our total enjoyment of Cartagena. We have partied with some of the richest (but still friendliest) people in the country. 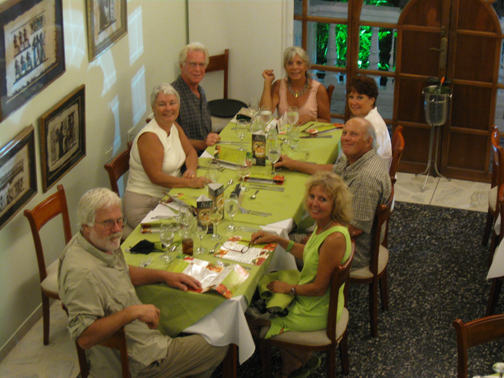 We have been invited to dinner and breakfast at a club member’s penthouse overlooking all of Cartagena. One couldn’t buy these kinds of experiences. Still, we’re eager to get going now. I think we have been on the dock too long. 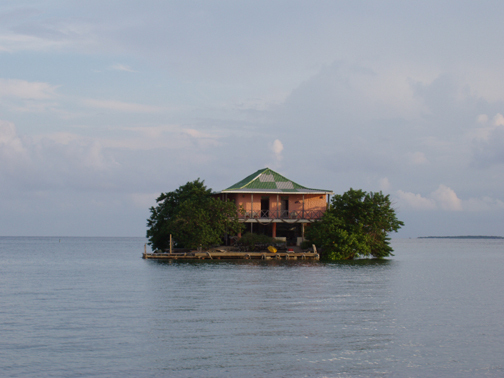 We have a Christmas party tonight, then various goodbye dinners and drinks, then we’ll leave next week for “something completely different” the San Blas Islands of Panama. I’ve attended (I hope) to all the boat tsouris (a broken high pressure hose on the watermaker, a leaking water pump on the generator, a maddening leak in the raw water supply line of the generator that took me hours to trace [it was as a result of a typically French Rube Goldberg design that was totally unnecessary], and other smaller projects). We’ve also gotten a lot of medical projects taken care of here. They have good practitioners and very cheap prices. There is a “weather window” for next week (that just means that the winds will be something less than 30 knots, and the waves less than 12 feet). We’ll probably be going alone, because all of our friends going that way want to stay for New Years. We’re ready to leave. We’ll probably come back here some time. Hasta luego, Cartagena. What a town! Twenty years ago, we didn’t come to Cartegena because we were scared off by all the bad press about drug wars, pirates and other tsuris. What a mistake. 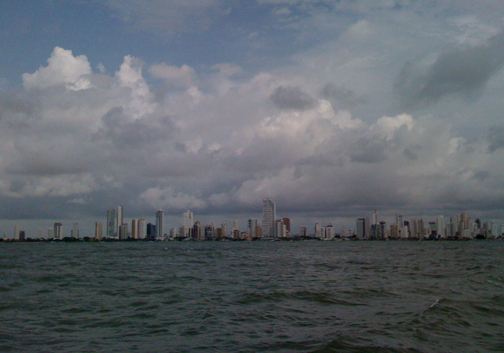 Cartagena des Indias (the proper name) is by far the best town we’ve been to by boat, on this or any other trip. It’s a World Heritage site. 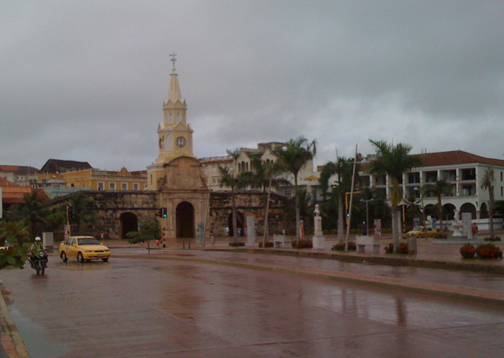 The old town (called Centro) is a completely walled island with original 16th century architecture. Think French Quarter of New Orleans, only much better. Forts are everywhere, including the marina we’re staying at, which occupies an old fort (the entrance has no sign; you just have to know where it is). 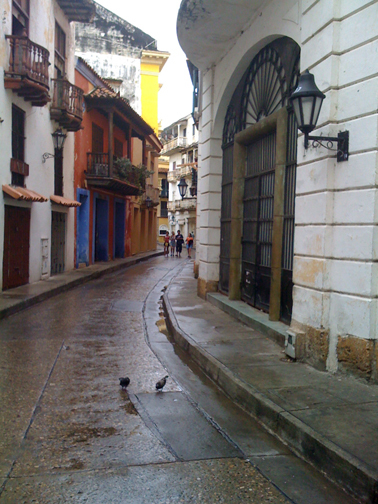 We’ve learned that Cartagena has always been safe pretty safe, even during Colombia’s time of trouble. 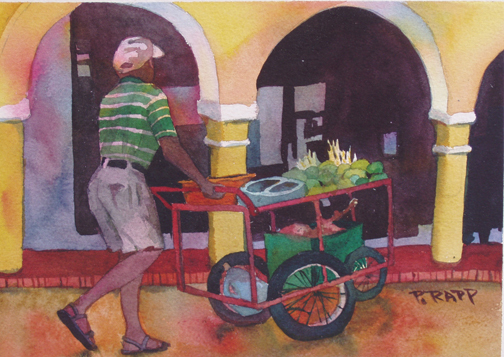 It has a laid back, Caribbean atmosphere. All the warring factions have respected it’s neutrality (even drug lords, communist guerillas, and right wing terror squads need a place to vacation). Now, Colombia has entered a period of relative stability and peace, thanks in large part to it’s president (Urribe), who is almost universally admired by Colombians, unlike the situation in some other countries we know (are you listening Chavez, you moron). We’re staying at the Club de Pesca, a private club that allows transients. Most of the cruisers are down the street at Club Nautica, which has the same feeling (for us) as Georgetown, Bahamas, where 400 cruising boats vegetate for the winter. Endless meetings, dominoes, flea markets, wife swapping, etc. Here, there are about 10 transient boats, and it’s way better. The Club is wonderful and hospitable, inviting us to functions, helping out and being extraordinarily friendly (as an example, we were invited to breakfast at a board member’s house last weekend). This week is their annual fishing/racing tournament, which we will participate in. That means, in addition to the races, free breakfast every day, free dinners at night, and endless parties (something Colombians are very good at). 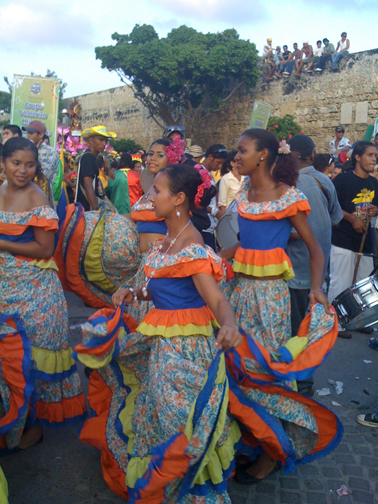 Of course, part of the festivities will involve the Colombian national sport of beautiful women parading around in hardly anything. When we first arrived, they were celebrating Independence Day (which went on for 2 weeks). 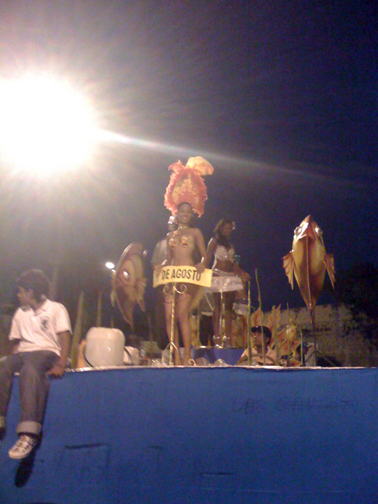 Most of the celebrations consisted of gigantic parades through Centro featuring the Miss Colombia contestants (including a boat parade, which we had front row seats for). 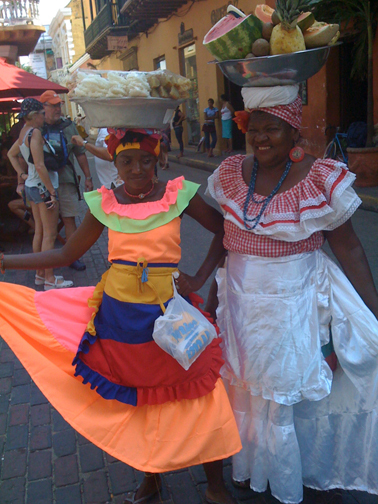 Colombian women are often quite beautiful, and the Colombians know it and celebrate it. It’s not for nothing that Colombia has had more Miss Universes than any other country. The parades were like an endless Mardi Gras, but much better. 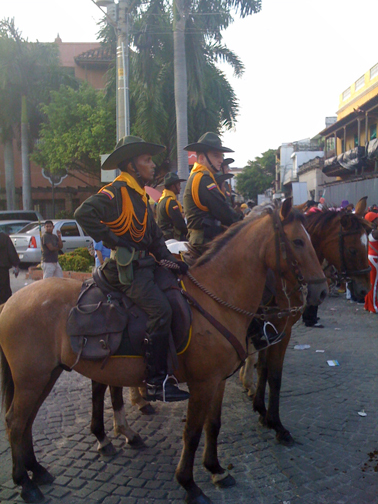 Colombians seem to be generally happy and friendly. They like Americans (apparently the only ones left in the world that do), and always have a hola! (hello) for you. The Club is on a nice residential island called Manga, which is conveniently just across a small bridge from Centro. We walk everywhere, including at night. No fear. The town is full of good, often inexpensive restaurants and shops, and more traditional places where you can buy or get anything fixed. So far, to my amazement, we’ve had our TV fixed, and today, I had a pair of flip flops (my favorite Reefs) repaired (for $1.25). Try that in the States. The only down side to all of this, is that we’ve been stuck on the dock for so long, living in a very nice floating apartment. It’s nearly impossible to leave, what with all the socializing, going out to eat, etc. When we first arrived early in November, our friends Bruce and Sandy were visiting, so we took them cruising to some local islands for a few days. 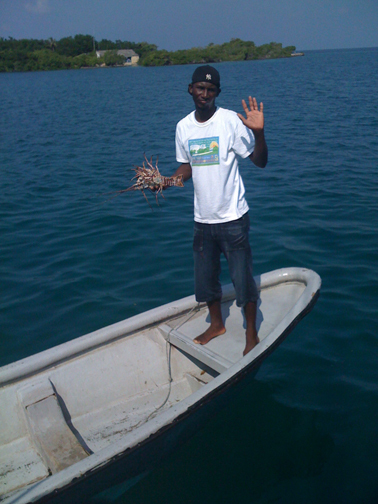 That was great: we actually had some fishermen deliver cooked lobster to us. I would like to go again (we probably will next week), but boy, are we having fun being degenerates. This also isn’t very healthy for our bank account (neither is the stock market; it’s hard to economize by pinching pennies when you lose thousands of dollars every day). Oh well, one of us is a rich woman. For the benefit of our sailing friends (who have complained that I don’t include enough navigational information), the trip here from Curacao was a mixed bag. It was supposed to be potentially dangerous (it has the reputation of being among the 5 worst passages in the world). The most wind we had was 35 knots and pretty big seas, but no problemo, “Antares” and crew did fine. Some legs even required motoring, which drives me crazy when going downwind in the Carribbean. “Antares” is a pretty big boat, and needs 15 to 20 knots to sail downwind well, so I prefer windy conditions, to a point. 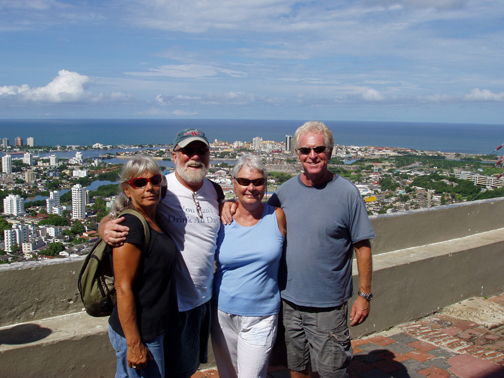 We arrived in a terrible tropical depression, with friends George and Pixie of “Silver Sea”. Getting into Cartagena was tricky; you have to cross an underwater wall at Boca Grande built by the Spanish 400 years ago to keep out the British. It apparently doesn’t work on Americans. 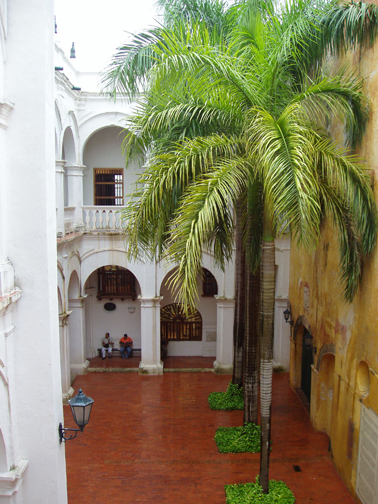 Plans are to stay through xmas, which is, we hear, wonderful in Cartagena. 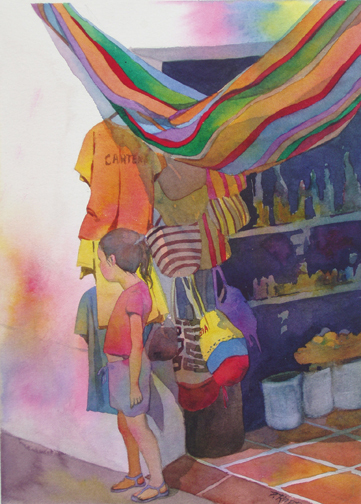 Then to Panama (particularly the San Blas Archipelago, a semi-autonomous group of islands controlled by the Kuna indians, famous for moles [mole-ace] shirts and wonderful soft shoe dancing). 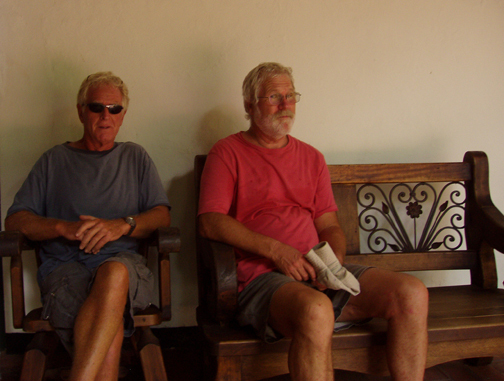 We’ll leave the boat in Panama, and return to the States in early Feb. Upon returning in March, we’ll have the boat hauled out for bottom painting, etc. After that, who knows? Maybe Barack will let us go to Cuba. 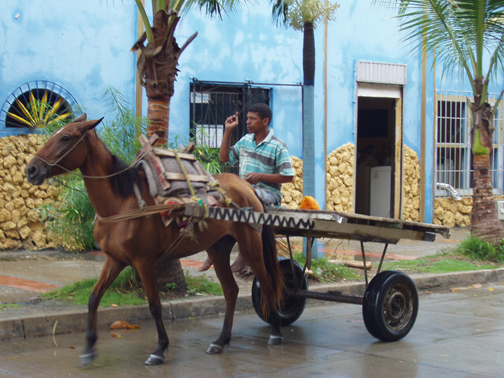 If anybody is looking for a slightly different Caribbean vacation, Cartagena would be a good choice. If you have any money left, try the Santa Clara Hotel. It’s in Centro, constructed within the remains of an old convent, and wonderful. It’s a bit pricey, but worth much more. We go there to drink, eat and gawk. Did I mention the beautiful Colombian women?